This morning as I was catching up on some of my favorite reads in the blog world I found this – I Don’t Like Pie – by The Orange Bee – Linda – great recipes, great stories and quite a beekeeper. Thank you Linda for the inspiration. I like my grandmothers lattice topped cherry pie nut it has been 30 years since i last enjoyed one. I am a huge fan of Blackberries and cobbler – I think I shared this recipe a long time ago but it being summer and berry picking and consuming time I thought that I would share it again – It has been a prize winner for several folks that have provided it for local dessert contests. Meme’s Blackberry Cobbler – it is so good! 5 cups blackberries, fresh or frozen 6 is better in my opinion! Preheat oven to 350 degrees. Place butter in a large iron skillet; place skillet in oven to melt butter. Put blackberries in a large bowl. If they are frozen, let them soften a few minutes. Crush lightly with a potato masher. Sweeten with extra sugar if you like. You’ve reminded me how good fruit pies can be ! And yes, my granny used to make brilliant ones too, her pastry was so light! Nice and simple recipe, thanks. 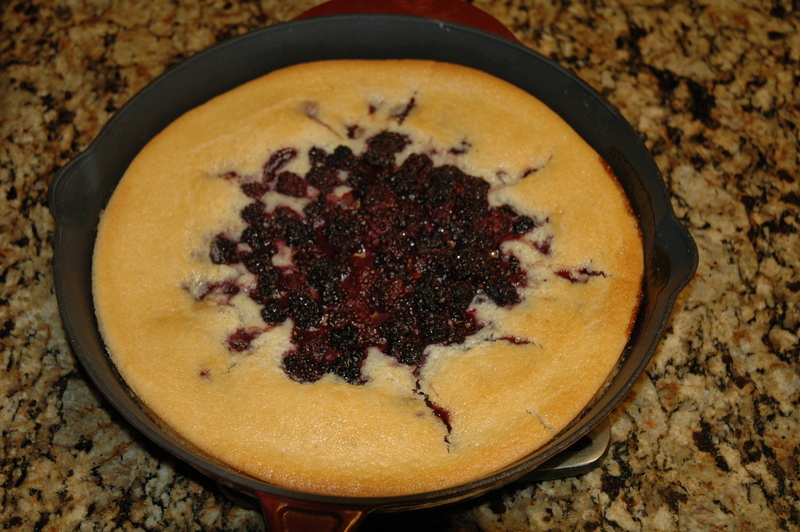 I was amazed at the ease of making and the remarkable flavor of this blackbery pie/cobbler….